LibertyCon | Larry Atchley, Jr.
I’ll be a guest author at LibertyCon again this year, June 27-29 in Chattanooga, TN. This is my fourth year as a guest and I love this fantasy/science fiction convention so much. As we have done every year, The Irredeemable Order of Hellions will be having a book launch party at 10:00 PM in the Con Suite for our latest volume in the Heroes in Hell Series, created by Janet Morris and published by Perseid Press. This year we bring you Poets in Hell. 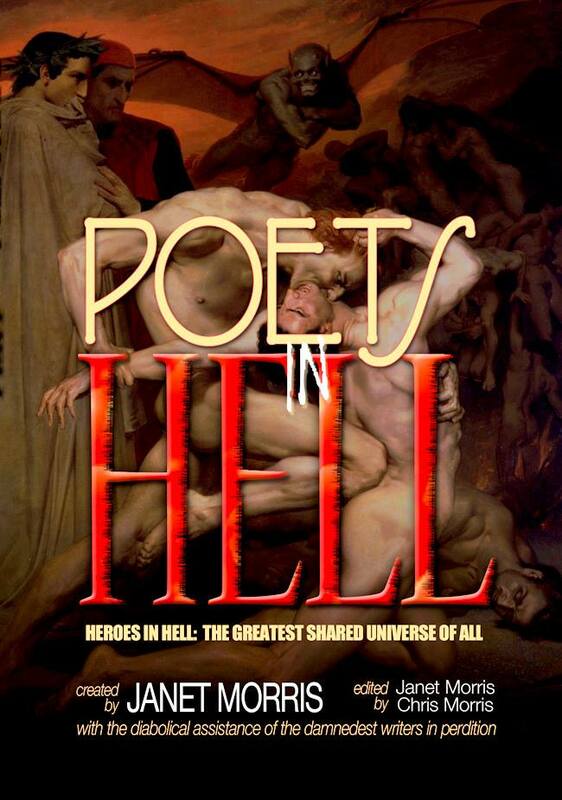 Poets in Hell, vol 17 in the Heroes in Hell series created by Janet Morris,from Perseid Press. Here is the link to my schedule of appearances at LibertyCon this year. Sat 01:00PM What’s New in Horror and Dark Fantasy? I always have a great time at conventions, and LibertyCon is no exception. It was my very first convention that I attended as a guest author so it is very special to me. Thanks go out to Rich Groller for getting myself and a lot of our other Hellion authors on the guest list every year since 2011. There will be a few of us Hellions around at LibertyCon this year: David L. Burkhead, Jason Cordova, David Drake (from the original Heroes in Hell books published from 1986-1989 by Baen Books) Jack Finley, Rich Groller, Michael H. Hanson, John Manning, Beth Patterson, (who is also the musical performer guest this year), pdmac, and Michael Z.Williamson. I hope to see you there. It will be a hella good time. Okay, I know I haven’t been keeping up with posting the blog on a regular basis. Again. I am bad. I am incorrigible. I am a procrastinator by trade. For those of you who have stuck with following this blog even through its intermittent ramblings, I thank you. There is a lot to catch up on so this will be a lengthy discourse of what’s been going on in my life over the past few months. At the end of last year I started attending The Seadog Slam’s bimonthly shows that took place at the Half Price Books Flagship Store in Dallas. Every first Wednesday there was a Steampunk show with songs performed , poetry read,and neat garb and gadgets displayed, as well as presentation son Steampunk culture and literature. I wrote a couple of Steampunk poems that I read, presented a brief biography of Jules Verne, and also read a review I wrote of Jessica McHugh’s book, The Sky, the World. 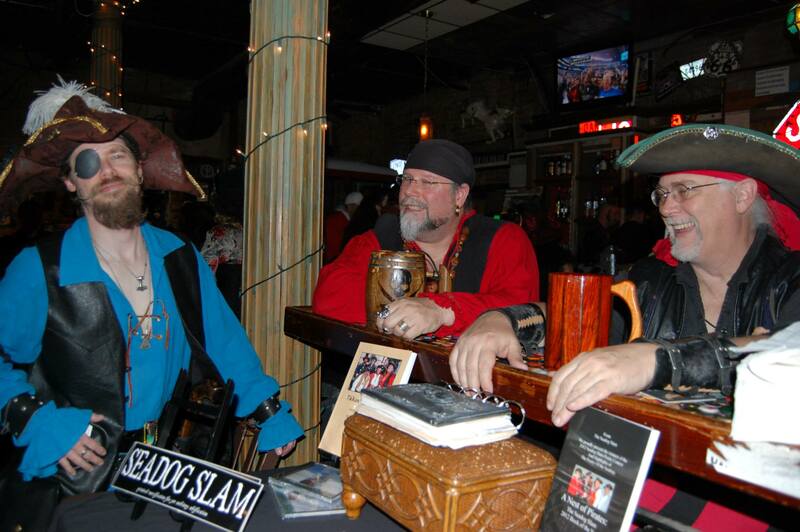 Every Third Wednesday of the month there was a pirate themed show performed by the crew members of The Seadog Slam, with an open mic session for the last half of the show. Performers dressed in their pirate garb for full effect and I broke out my pirate costume that I had put together a few years ago to wear to parties, pirate festivals and Renaissance faires. I had been writing a few pirate poems which I read at these sessions which were apparently well received, as I was asked earlier this year to join the Seadog Slam as as auxiliary crew member. This meant I would be on call to help them complete a roster of performers for various events in North Texas especially when regular members cannot attend. Words cannot express how happy I was to join this group of pirate poets. Recently they even decided to make me a regular crew member, which means I will have an opportunity to perform at all their shows and on CD’s they record of poetry and songs. I purchased a copy of The Pirate Primer so I can brush up on my piratical lingo. I’ve been wanting to buy this book ever since I checked it out from the Bedford Public Library a few years ago. Now I had a good excuse for acquiring it. Like I needed a reason to buy a book about pirates. Ha ha! The Seadog Slam will be working on a CD of dirty limericks this Summer so I have to get cracking to write some original limericks to read for the recording. In April The Seadog Slam were the MC’s at an event called Down to the Depths: A Ghost Pirate Masquerade at the Wit’s End club in Dallas’ historic entertainment district, Deep Ellum. 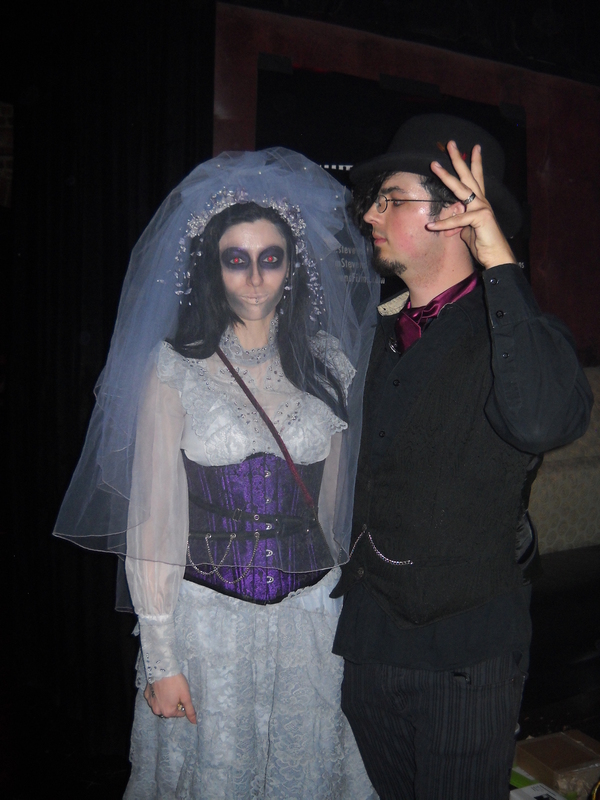 It was a show put on by The Shadow Society to raise funds for the Steampunk November 2014 event. Earlier that week I had broken one of my hard contact lenses and had been forced to wear my coke bottle glasses to see. Determined not to look like a dork at the show, I decided that once I got to the club I would put in my one left contact lens and wear my pirate eye patch over the other eye for piratical effect. That was all well and good, except I had not counted on it being so hard to read my poem with one eye. A lack of depth perspective really messes things up. I managed to pull off the reading somewhat, although it was certainly not my best performance to date. Nothing a bit of rum couldn’t make better though. Ah, it’s a pirate’s life for me. Arrgh! All the performers that night were wonderful, from the opening band, Irish Blind, the burlesque performers, and sword fighting by Cut, Thrust & Run. It was fun being an MC, and introducing the band Esoterik, whose music and performance I really enjoyed. Allison Eckfeldt’s vocals and dancing were awesome, Brady Bledsoe on Guitar and keyboards was amazing, and Austin Hayes on keyboards was excellent. I got the band to autograph their CD I bought, and they were all very cool nice people to talk to. They are from Oklahoma City which is my birth city and where I still have a lot of aunts, uncles and cousins living in the area. I will have to catch some more of their shows in the future. I’m hoping they will be back here in Dallas soon, or that I can make it up to OK City. 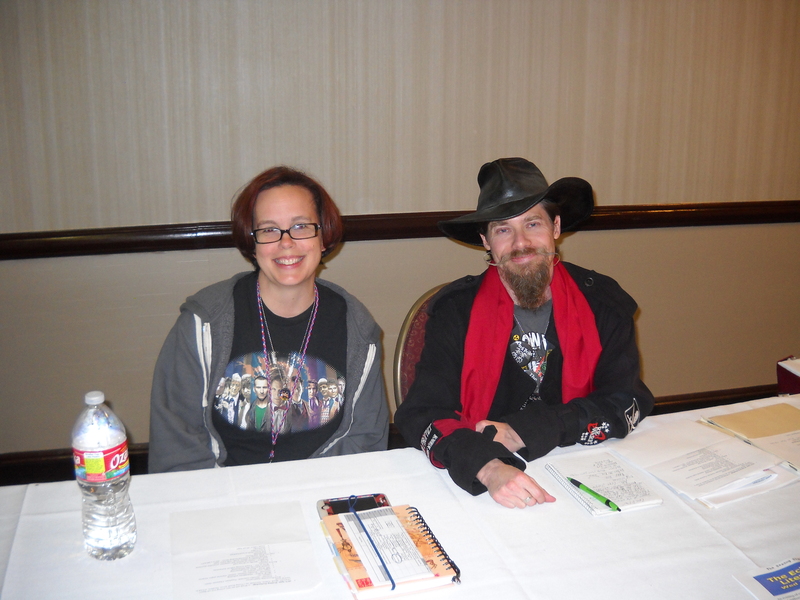 Going back a little earlier in the year, in February I was a guest author at the ConDFW literary fan convention. This is my third year as a guest and I had a blast as always being on discussion panels, doing readings and book signings. I get to meet up with a lot of fellow authors who are friends at these events and generally have a great time. There are too many people to mention everyone here and I will inevitably forget someone, since my memory is like sieve. So my apologies if I don’t name you, but I have to at least run down a short list of people I got to hang out with and or be on panels with: Dean Andersson, Ethan Nahte, Selina Rosen, William Ledbetter, Bev Hale, Michelle Muenzler, Nina Romberg, Lou Antonelli, Melanie Fletcher, Mel White, Angeline Hawkes, Christopher Fulbright, Amie Spengler, Rachael Acks. Special thanks to friends and fellow writers Alaura Sandler and Jenn Monty who took photos of me on several panels. ConDFW panel with Bev Hale, C Dean Andersson and Larry Atchley Jr. Promoting the anthologies I am published in and talking about writing and fiction fandom is always a pleasure. The after parties are always awesome as well and I get way too little sleep during these convention weekends. But it is all so worth it. I’m looking forward to next year already. I had someone snap a photo of me at my signing table with all the books In which I have stories published. And I’m proudly wearing both my Irredeemable Order of Hellions, and Fictioneers badges. On my right arm is my Bethodist patch marking me as an adherent of my friend Beth Patterson’s personal spiritual movement of bouzouki babe worship and musical religiosity. More on Beth later in this post. It’s harder to see in this photo but I’m also wearing my Darwin Prophet & the Chronus Mirror patch showing my support for yet another awesome group of musicians. Thanks to my daughter Alina for making the armbands and sewing the patches on for me. Next up in my busy Spring schedule of fun stuff was the North Texas Irish Festival. I have been going to this event ever since around 1996. It has been going on for over thirty years now, and is the largest Celtic music festival in the South, and one of the largest in the USA. There are so many excellent bands and solo musicians that play this festival. Also it has huge vendor turnout and there are so many great hand crafted items for sale. Money was tight this year so I couldn’t go crazy with the purchases, but I did pick up a CD from one of my favorite bands, Poor Man’s Fortune, and a really cool pin/brooch with the skull & crossbones on it. I figured it would go well with my pirate garb. It has been my pleasure to get to know the band members of Poor Man’s Fortune, especially Beth Patterson who I met initially on facebook a couple of years ago through mutual friends. We got to meet in person last year at the Irish Festival and we swapped copies of my anthologies that I have stories in for a bunch of her music CD’s. She had confessed that she was a musician with writer envy, and that she was working on writing a fiction story based on her experiences in the music business. I told her that I was a writer with musician envy and that I wanted to put a band together. We realized that we both appreciate good music, good books, and irreverent dark humor, so a solid friendship was inevitable. We got along so well in fact, I decided that she must be my long-lost evil twin sister that I never knew I had. I introduced her on Facebook to some of my fellow Hellion authors and especially Janet Morris, and also some other editors with publishers that were looking for stories to put in anthologies. She just had a story published in a collection called Rise of the Goddess, and she will have a story in the next Heroes in Hell book, Poets in Hell which also will have my story “Poetic Injustice” in it. So she is now officially a Hellion author after earning her way into our illustrious ranks with what I’m sure will be a very good story that I am looking forward to reading. Earlier this year she also published her first book Mongrels & Misfits, which has an awesome short story and a whole bunch of her song lyrics in it. I got to be one of her beta readers for the story and she thanked me in the acknowledgements page of her book which was cool and very sweet of her to do. She is an excellent musician and is turning out to be just as good of a writer as well. I like to refer to her as the hardest working musician in the business because it seems like she is always playing gigs, recording albums, and promoting herself 24/7/365. She performs in and around New Orleans Louisiana when she is not on tour in various other parts of the world, like Japan, and Canada. She will be performing her music at this year’s LibertyCon in Chattanooga, TN where we will both be guest authors as well. 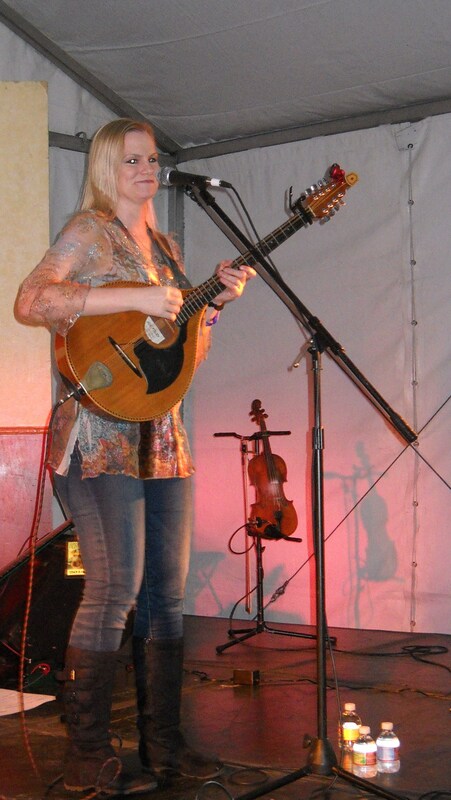 Check out her web page here at Bethpattersonmusic.com. She just released an excellent new solo album Fast Forward which you can purchase on her webpage. She has it available as a digital download and as a USB flash drive that is made into a rubber bracelet so you can wear her music. Here’s a photo of Beth performing with Poor Man’s Fortune which includes Larry Rone on vocals and wind instruments , Richard Kean on pipes, Wolf Loescher on drums and percussion, and Beth Patterson on vocals and bouzouki. They just released a new CD called Bayou Curious that has a blend of Cajun, Scottish, Breton, and French traditional music, and it is a joy to listen to. It is very lively and upbeat. You can buy it on the Poor Man’s Fortune webpage. Some other great bands I saw at NTIF this year included The Town Pants, from Canada, who closed out their set witha cover of Iron Maiden’s Run to the Hills, which was totally unexpected. 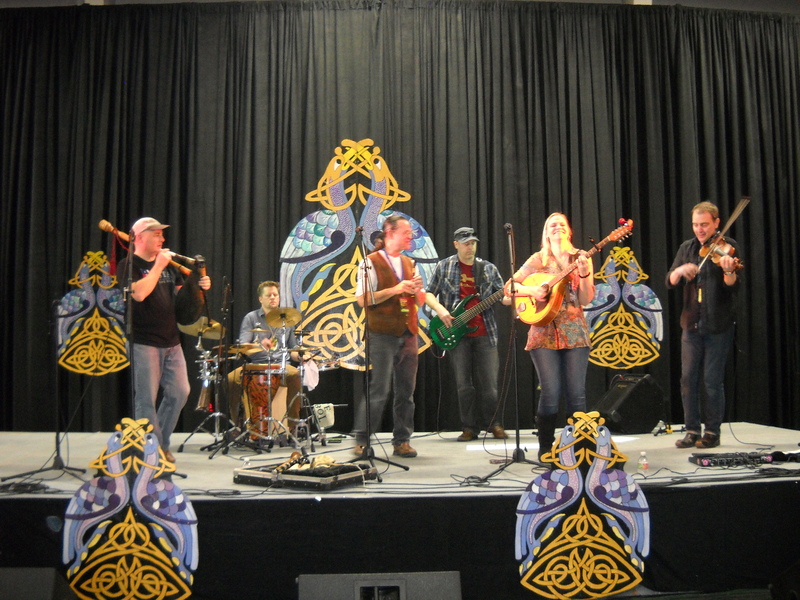 Also the band Beyond the Pale who I have seen perform several years at NTIF and other Celtic music festivals like the no longer active Celtic Heritage Festival which was held in my home town of Bedford. There was so much excellent music but these are the ones that stand out in my mind the most. Okay so on to the next convention and this is a big one that I have been honored with being a guest at for the past three years. All-Con in Dallas. This event encompasses everything to do with fandom whether it is science fiction, fantasy, horror literature, film or television, anime, women’s roller derby, burlesque entertainment, stand up comedy, sword fighting action shows, music, etc. You name it and there is probably a discussion panel or performance to do with it at All-Con. I got to be on some great panels with some awesome authors this year as always. First and foremost I must mention my friend Jenn Monty who helped me come up with topics for five of the panels that we were on this year. She also did meticulous research and printed out notes for us to use, including creating a writers’ notebook for compiling story notes and information for our panel on how to organize all the stuff you use when writing a novel. 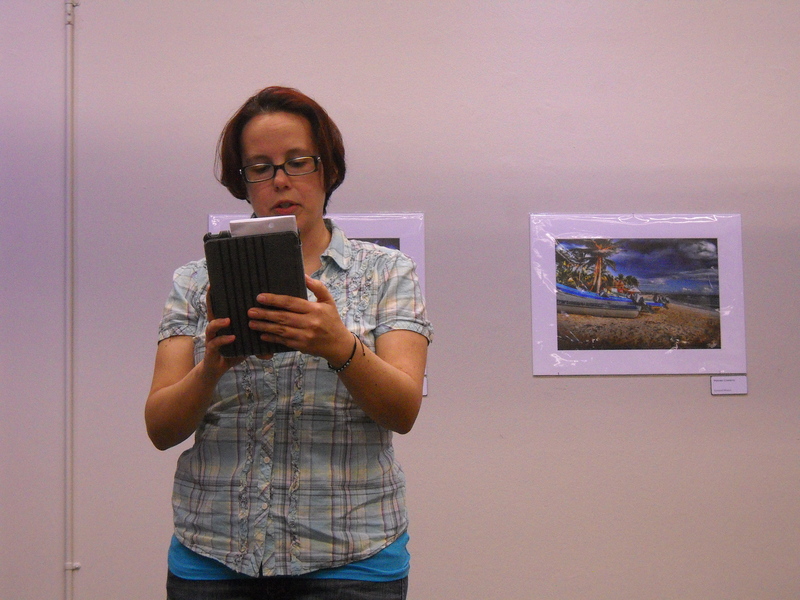 She made several copies which were handed out to the audience. We had a really good turnout for that one. Jenn publishes a blog called Brewed Bohemian where she posts her flash fiction and poetry, along with the latest open submissions for story contests and anthologies. She posts reviews about beer on there too which is really cool. Jenn is a very talented writer, and I hope we will share credits in an anthology together someday. She recently asked me to be one of the judges in a Steampunk & Dieselpunk flash fiction contest called Dirty Goggles that she was holding along with some other authors. Go check out her blog to read the stories and find out who won. Plus check out all the other cool stuff there too. I shared panels with some other awesome fellow authors and experts like Larry And Tina Amyett of the North Texas Dieselpunks, Steve and Melody Sanders of The Seadog Slam, Ethan Nahte, Mel White, Bart de Boisblanc, and Gloria Oliver. I also got to hang out with my good friend Darwin Prophet who was one of the musical guests this year. I got to see a whole bunch of other friends that I usually only see at cons or other special events. There are probably too many people to list and I will inevitably forget someone so I’ll just leave it at that. You all know who you are. 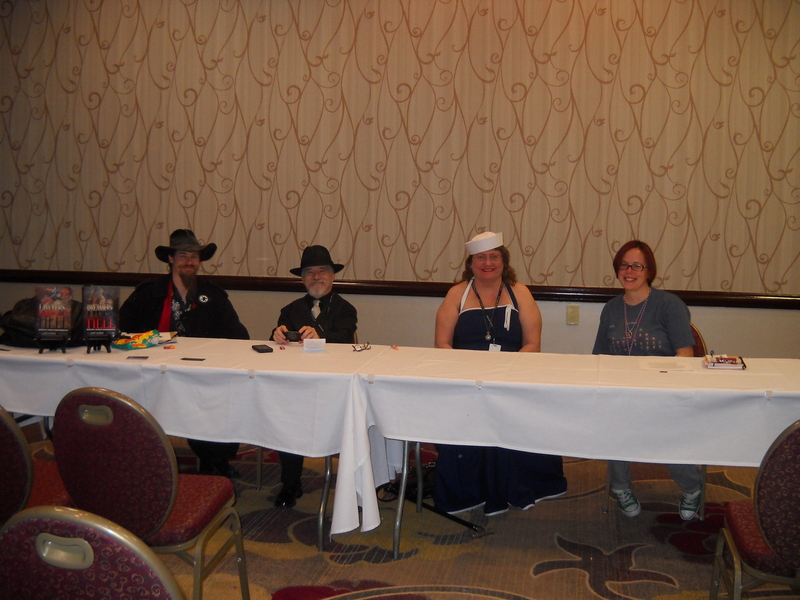 All-Con 2014 Dieselpunk & Steampunk Panel. From Left to right: Larry Atchley Jr, Larry Amyett, Tina Amyett, Jenn Monty. 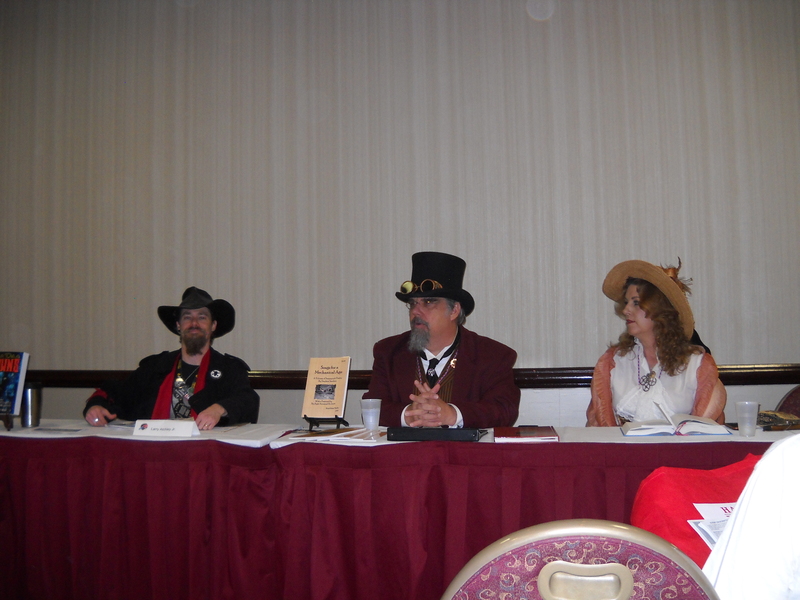 All-Con 2014 Steampunk Poetry panel. Larry Atchley Jr, Steve Sanders, Melody Sanders. 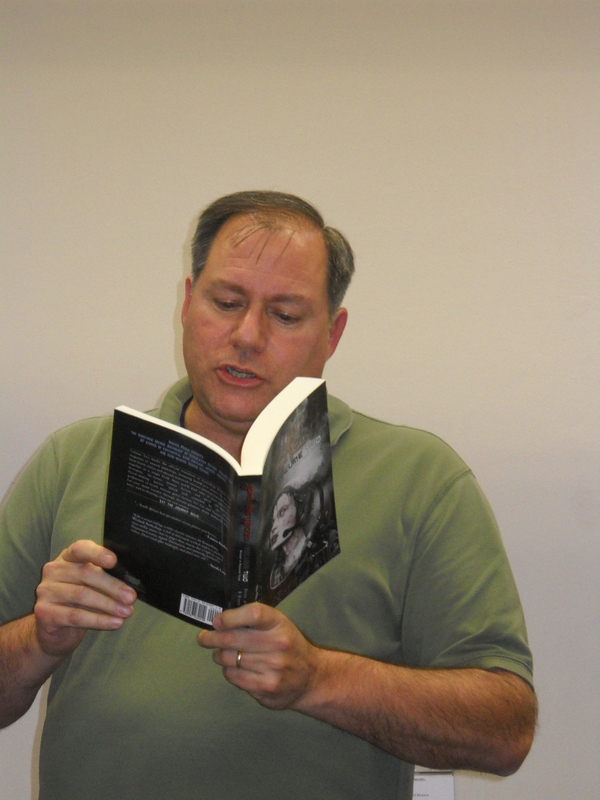 On March 19th I put together a author reading event that took place at the Half Price Books Dallas Flagship store. How this came about was that the Seadog Slam crew were not going to be able to do their usual pirate themed show they presented the third Wednesday of every month. I was asked if I wanted to put on an event by myself. I leapt at the chance and I decided that rather than do a pirate show I wanted to do something different where authors of various genres could read their work to an audience. Thus was born The Eclectic Muse Literary Revue. I gathered together five local Dallas/Fort Worth Metroplex authors which included myself, Darwin Prophet, Jenn Monty, Jessica Scott, William Ledbetter. Author C. Dean Andersson was supposed to read too but had to cancel due to having the Flu. We had a small but enthusiastic audience and the event went well. It was the first time that both Jessica and Jenn had ever read before an audience and they did awesome even though they admitted they were very nervous. They each read some poetry and flash fiction that was excellent. Check out Jessica’s blog, The Lunatic, the Lover, and the Poet where she posts a lot of her poetry and prose, and Jenn’s blog at Brewed Bohemian. William read excerpts from a couple of science fiction short stories that were very gripping and intense. I read part of my Rogues in Hell story, “Ragnarok & Roll” and Darwin read a bunch of her “prosetry” that includes her day to day thoughts and musings, and closed the event beautifully by singing the British anthem “Jerusalem” which was written from a poem by William Blake. We all had a great time and I was glad to be able to bring some fellow authors together to showcase their talents. I’m hoping to do another one of these sometime in the future. 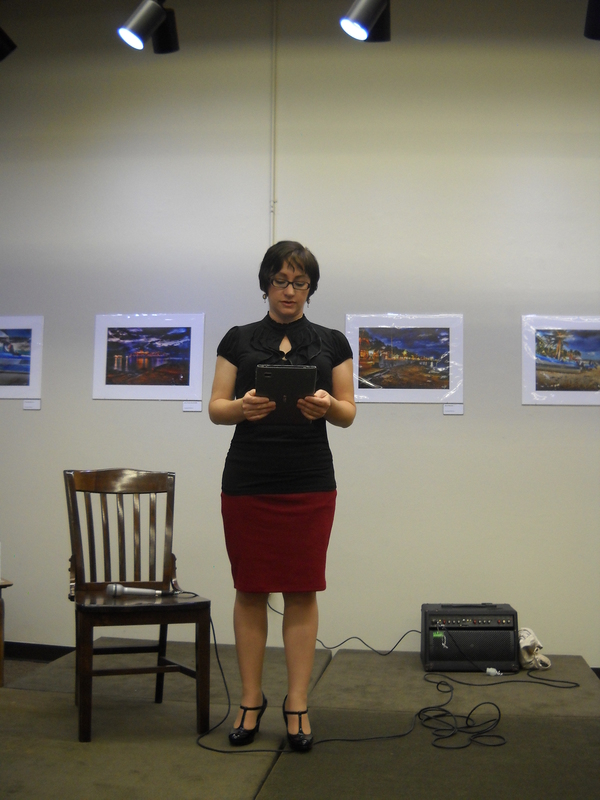 Jenn Monty reading at The Eclectic Muse Literary Revue. William Ledbetter reading from his story at The Eclectic Muse Literary Revue. Darwin Prophet reading Prosetry at The Eclectic Muse Literary Revue. Something cool that I got to attend in April was the short film premier of Love is a Grave, by my friend Tim Stevens with Title Pending Productions and Tim Stevens Films. The premier party was called Into the Grave and was held at the dance club The Church in Dallas’ historic Deep Ellum arts and music district by The Shadow Society. Darwin Prophet & the Chronus Mirror performed at the premier and Darwin actually co-wrote music for the film with Director/Filmmaker Tim Stevens. Another band that performed that night was Ending the Vicious Cycle fronted by singer/songwriter/guitarist/keyboardist, Toby Rider. There was also a dark burlesque show which included Vivienne Vermuth and Cat de Lynn. The film was awesome and the party was a blast. I had a lot of fun dancing and hanging out with friends including Cindy House who I have known since high school and who I hadn’t seen in a few years, and who is a regular at The Church. Also in April I also got to be an extra in one of Tim’s latest projects, a web series called You are Here, that was filmed at The Curtain Club in Deep Ellum in Dallas. That was a lot of fun, but it was hot hard work. I was in several scenes that involved dancing at a Goth vampire night club party. They couldn’t run the Air Conditioning units because of the noise and it was very hot inside the club. It didn’t help that I was wearing leather pants, boots, and my signature long black coat. My friend Darwin Prophet was also there as an extra to help support Tim’s project. I also got to be in a few additional scenes that just involved standing and acting like I was talking to another extra, Shana, who I met at the filming. She was pretty cool and has some interesting life stories. She is about my size, (petite that is) and also takes martial arts so we had that in common to talk about. She is a professional model working in the Dallas/Fort Worth area. I met a lot of other great people who were extras and part of the cast and crew. Special thanks to Tim Stevens, John McCullagh, Mary Rochford, Jessica Sheriff, and everyone else involved with the production for making me a part of the action and taking great care of us by providing lots of water to drink and pizza for dinner. The web series is supposed to air sometime in June, so I’ll be sure to post a link to it in my blog when it does. I hope I look halfway decent in the shots. 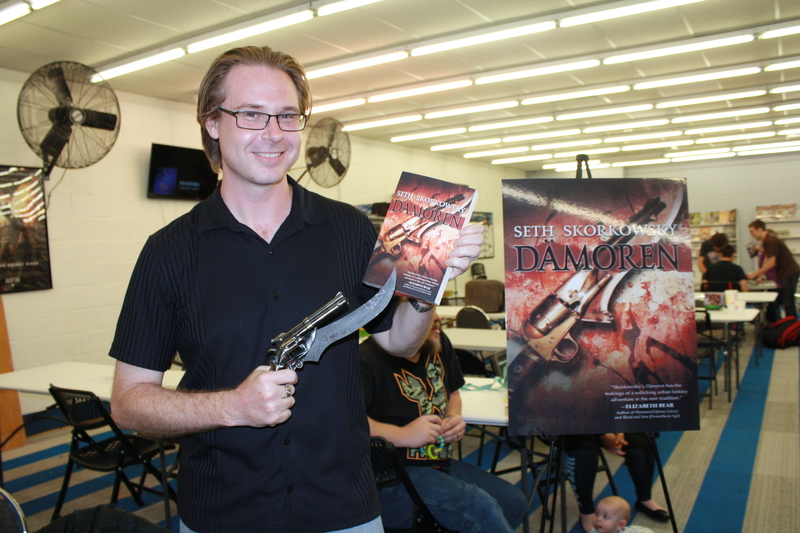 In May I went to fellow author Seth Skorkowsky’s book signing for his first published novel Damoren. It was held at game store Area 51 Gaming & Collectibles in Grapevine Texas, the town where I grew up. 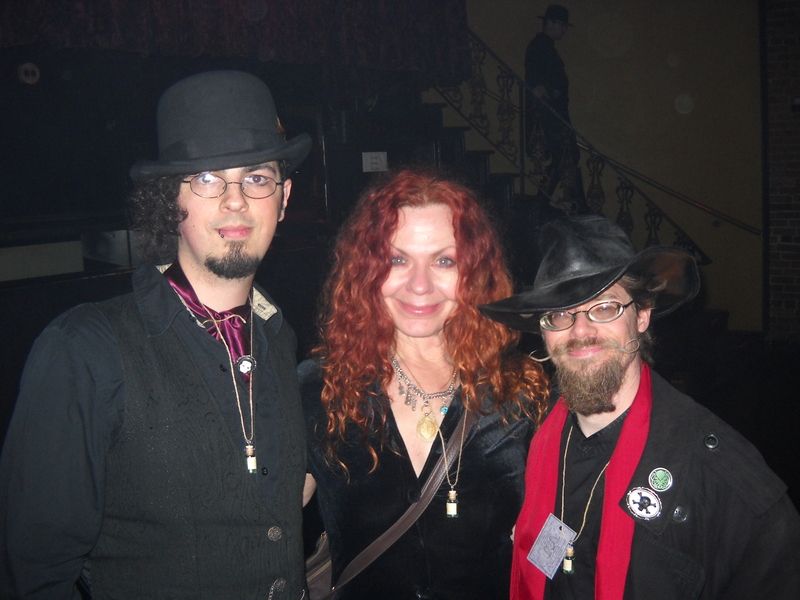 I met Seth at All-Con this year and it turns out that we have a lot of mutual friends in the writing and Steampunk community. I just finished reading his book and it is a thrilling action packed adventure with some very excellent writing and includes some very interesting concepts. It is book one of The Valducan series and I can’t wait to read the next book when it comes out next year. I’m looking forward to finally finishing one of my novels so I can do one of these events for a book that is all my own work. I love writing short stories and poems for anthologies, but having my own novel completed and published would be a great feeling. Well that is about it for now. The next big event things coming up for me will be attending Robert E Howard Days in Cross Plains Texas and attending LibertyCon as a guest author, both in June. This will be my first time to go to Howard Days. I have heard a lot of great things about it form fellow authors so I am looking forward to it. 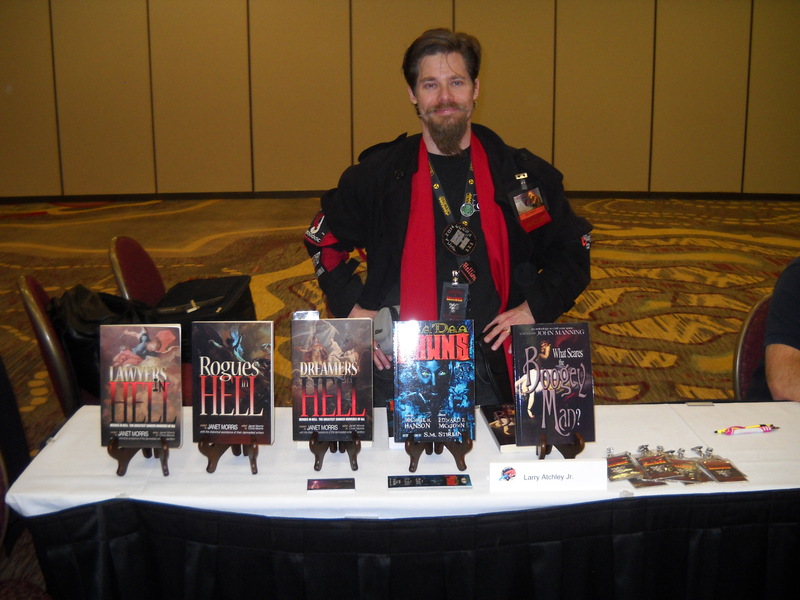 It is my fourth year as a guest at LibertyCon, which was the first con to book me as an author in 2011 after I had my first published short story appear in Lawyers in Hell. I am working on my dark fantasy/sword & sorcery novel that I am aiming at finishing this year. Also the usual short stories and poems as always. I’ll keep everyone posted here whenever I have my next stories and poems published. I have a few things coming out this Summer. I’ll leave you with a pithy quote as usual. Thanks again for following my blog and I’ll try not to take so long between posts next time. Well I’m finally getting around to posting my report about LibertyCon 25 which took place the weekend of July 20-22, 2012 at the historic Chattanooga Choo Choo hotel. I also upload photos on my facebook page and in some of the relvant groups I am a member of like The Irredeemable Order of Hellions and The Fictioneers. I had a great time hanging out with fellow Hellion authors Janet Morris, Chris Morris, Michael H. Hanson, Jack Finley, Sarah Hulcy, David Burkhead, Michael Z. Williamson, Richard Groller, and Julie Cochrane. Kudos as always to Janet Morris and Chris Morris for creating the Heroes in Hell series without which none of this fun would have taken place. Thanks for making me a part of this fantastic series that I’ve been a fan of for over 25 years. Also a big thanks to Richard Groller for bringing so many of us authors together by having us as guests at LibertyCon. Thanks also to Uncle Timmy who created and runs LibertyCon for having us again. It has become our annual meeting of the Hellions and I hope will continue to be so for many years to come. 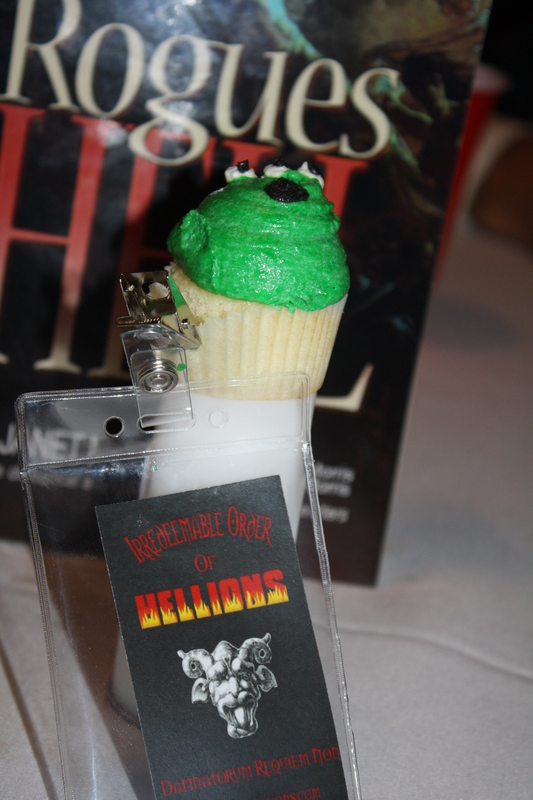 This year we decided to hold a party for both The Fictioneers writers club and the Irredeemable Order of Hellions fan club for the Heroes in Hell series and Perseid Publishing. 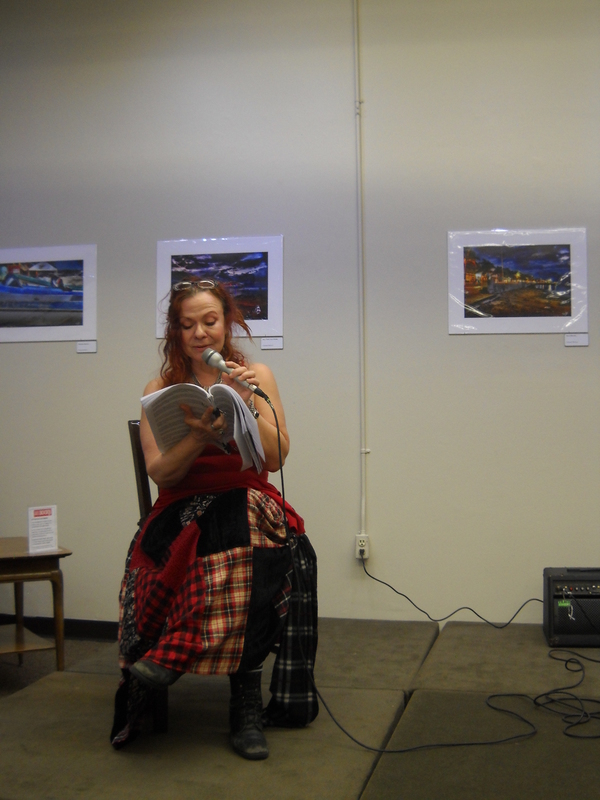 It was also our book launch party for the newest anthology in the Heroes in hell series, Rogues in Hell. I think the party was a success and I made many new friends and gained new fans for the HiH series and the upcoming book Sha’Daa Pawns created by Michael Hanson and edited by Edward McKeown. Michael also had a bunch of cupcakes made for the party with icing that looked like alien heads for the Fictioneers and flames for the Hellions. They were awesome sugary goodness and a real hit. Thanks to everyone who came out and partied with us. It was a hell of a good time! To join the Hellions online on Facebook for fun and interaction with Hellion authors and fans just click on the link above or right here. Several of us Hellion authors also took turns staffing the Perseid Publishing table to sell and sign books. It was a great experience and loads of fun. There is something really satisfying about sitting behind a table stacked with books some of which have your stories published inside them like Lawyers in Hell and Rogues in Hell. Also on this table were books from another of my favorite series, by Janet Morris and Chris Morris; The Sacred Band, Tempus With His Right-Side Companion Niko, Beyond Sanctuary, and The Fish, the Fighters, and the Song-Girl. Also Michael Hanson had copies of Sha’Daa: Tales of the Apocalypse, Sha’Daa: Last Call, and his poetry collections Jubilant Whispers and Autumn Blush. 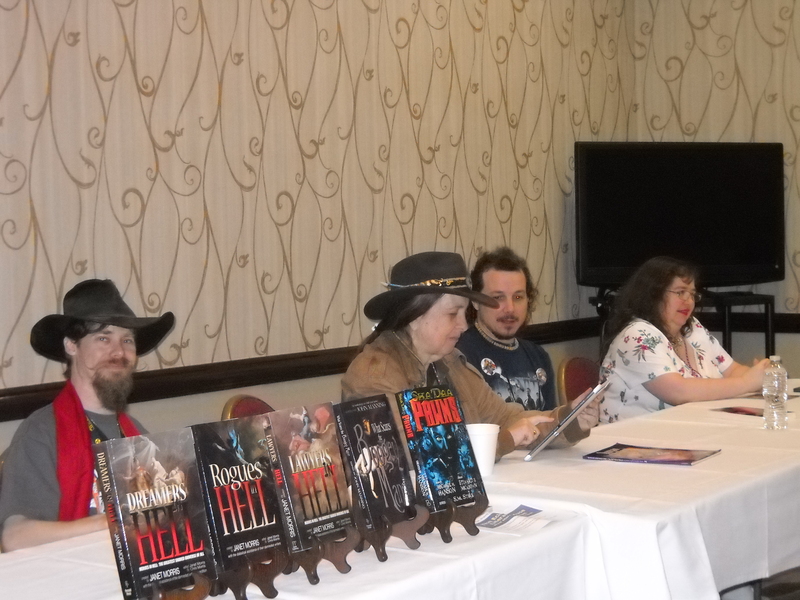 I got to be on some great discussion panels, like the Rogues in Hell panel where the attending Hellion authors got to talk about our new book. Also the What Scares the Boogeyman panel where we got to talk about the soon to be published horror anthology that John Manning is putting together which will feature my story “Shadow of a Doubt.” We also had a cool piece of artwork drawn just for the panel by Michael Bielaczyc that was outstanding. And thanks to author Larry Niven for attending our panel and contributing his thoughts on the horror genre. And then there were the paranormal panels I got to be on with Joe McKeel and Paul Cagle about EVP’s (Electronic Voice Phenomenon), Ghost Busting, and Joe’s Remote Viewing panel that he let me sit in on. All in all it was a fun, busy, and exhausting weekend and as I always seem to do at conventions I made a lot of new friends. And it was a blast seeing my old friends as well, many whom I only see in person once a year, even if we talk online a lot. I really can’t wait for LibertyCon again next year. I hope you will join me for a hell of a good time. I hope everyone is having a great 2012 so far. Mine has been pretty good except I’m still unemployed and looking for a full-time day job to pay the bills. Besides looking for work, I have also been busy learning as much as I can about improving my writing craft, the publishing industry, reading for pleasure and research, and I’ve been writing a lot as well. 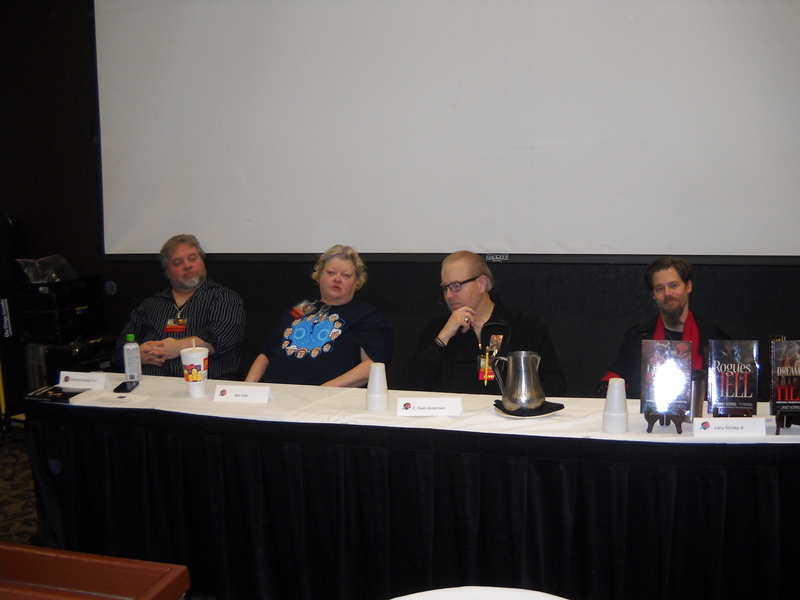 I have also been networking quite a bit, and I am scheduled to appear as a guest panelist at five literary fantasy/science fiction conventions this year, including ConDFW, AggieCon, All-Con, The Nightmare Machine 2012 and LibertyCon. I really enjoyed all the conventions I attended last year, and met so many great people; writers, artists, musicians, performers, editors, and fans. I am really looking forward to all these events this year and I hope to see you there. If you’ve never been to one of these events, you really should check them out. They are a lot of fun for fans of the fantasy, science fiction, and horror genres. You can meet your favorite authors, listen to live music, attend panels about a wide variety of subjects, see some cool costumes, buy books, shirts, costume apparel, and other fun stuff. Speaking of fans, I am a big fan of this free online magazine, Lovecraft eZine and this week they are having a contest giving away a Cthulhu sculpture and other prizes. I have read some great stories in this eZine and they are always posting news and links about everything to do with Lovecraft, Lovecraftian stories, Cthulhu Mythos, films, websites, etc. Go check it out and tell eZine creator/editor Mike Davis that I sent you. 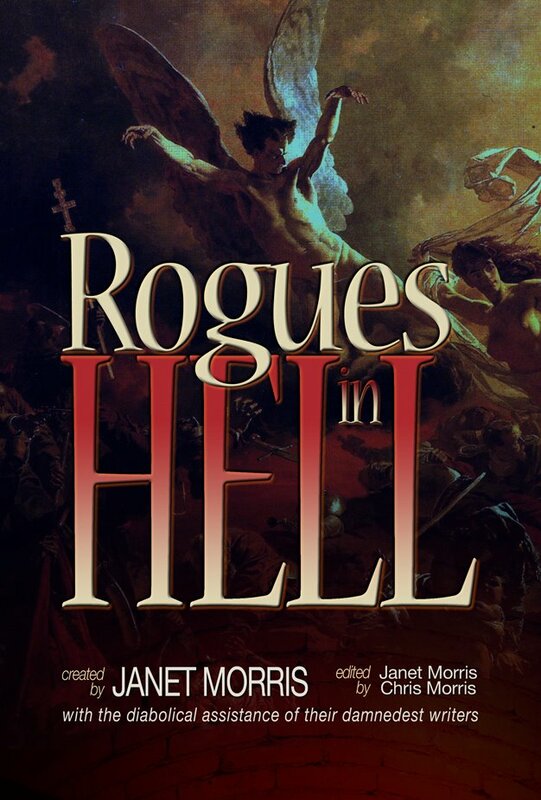 I am very excited to announce that one of my stories, “Ragnarok & Roll” has been accepted for the forthcoming Heroes in Hell shared world anthology, Rogues in Hell, edited by series creators Janet Morris and Chris Morris. The book will be unleashed upon the world by Perseid Publishing sometime this Spring/Summer 2012 in print book and EBook formats. As before, when working on the previous volume in the series, Lawyers in Hell, it was a blast collaborating with my fellow Hellion authors on this book. I’ll wrap this post up with what the cover will look like. 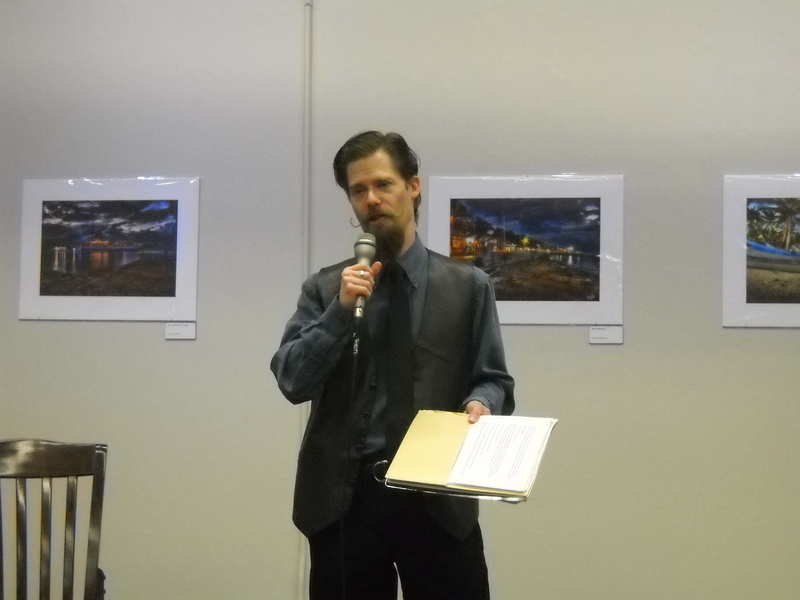 I recently attended my first literary convention as a published author and guest. LibertyCon 24 was an incredibly fun experience, and I met many authors, fans, convention promoters, and convention staff, while I was there. Since the book I had my first short story published inside, Lawyers in Hell, had just been released, it was also my first chance to get my hands on my own personal copies of the book in hardcover and trade paperback. Opening it up and seeing my story title, “Remember, Remember, Hell in November” with my name beside it was one of the best feelings I’ve ever had in my life so far. It has been my dream to have a story published since I was a teenager in high school, and now it had finally come true. The next best thing that happened was when I signed in at the convention registration table and got my packet with my T-shirt, schedule and ID badge and it said: Larry Atchley Jr, AUTHOR. Oh what a thrill that was to pull the lanyard over my head and wear that badge, proclaiming to the rest of the world that yes, I am an author, thank you very much! Then I looked over the schedule and I was part of several panels where I and the other authors could discuss our stories, perform readings, sign books, and in general behave as authors do at conventions. A bonus was that I was on a panel for a forthcoming book of poetry call The Book of Night, that would feature one of my poems as well, and I would get to read my poem to the attendees of the panel. On top of all this excitement, I was meeting many of my fellow authors who had written stories for Lawyers in Hell, whom I had communicated with entirely through Facebook and emails for the last 8 months or so. Those authors who made it to LibertyCon this year: “Mad” Mike Williamson, Sarah Hulcy, John Manning, Leo Champion, Michael Hanson, Allan Gilbreath, Kimberly Richardson, Julie Cochran, David Burkhead, Richard Groller, Jason Cordova, Sara Harvey. Amongst these authors, were the reason that I was given a chance to become a published author and part of the Heroes in Hell Series I had so loved since a teenager. Janet Morris and Chris Morris, who edited and wrote for the Lawyers in Hell book, and had created the Heroes in Hell series, had invited me to join the Lawyers in Hell project and submit my story to them back in October of 2010. Without them I would not be published yet, and I certainly wouldn’t be a guest author at a convention. It was really great meeting them, and being able to listen to them talk about their experiences in the writing and publishing industry, and about all kinds of other interesting topics. Kudos go out to another person responsible for my being a guest at LibertyCon, and that is fellow author and convention organizer, Richard Groller, who arranged for all of us Hellions, as we authors for the series are called, to be invited to the convention. He and his wife Tish did an excellent job of running things and making sure we all had what we needed and had a good time. I would like to thank everyone on the staff at LibertyCon fo making me feel so welcome and special as a guest for my first time. Also, the food and refreshments at the convention were really great, everything was fresh and tasty and I don’t think I went hungry at all during the whole weekend. A really special moment was when during the opening ceremony for the convention all of the guest authors names were called and we were asked to stand for a round of applause. Another was being asked by fans who bought the book to sign it for them. Then I got to put on the official launch party for the fan club and community that I started for the Heroes in Hell series and also to support The Sacred Band series. The Irredeemable Order of Hellions was something I thought up a few months ago to help bring fans of the books together, and be able to interact with the authors. We had a projector set up to run the book trailer videos that Kerlak Publishing had done for The Sacred Band, and that our own Zombie Zak had produced for Lawyers in Hell and the Heroes in Hell series. I had printed and laminated a bunch of badges for the authors to wear and to give out to fans who came by the party. I also had a poster made and framed that we set up on a stand in the room. It was great fun meeting all the fans and authors who dropped by for the party. The LibertyCon staff were a great help setting up and helping to run the party. I could not have done it without them, especially Rich, Liz and Tish who were especially helpful. It was a thrilling, exhausting ride of fun and excitement, laughs and deep discussions. I made a lot of new friends, and I can’t wait until next year!